Hort Americas is now offering OSRAM’s ZELION HL300 series of horticultural LED fixtures including controls and accessories. One of main advantages of the fixtures is they are controllable allowing users to adjust both the light intensity (light quantity) and the spectrum (light quality). 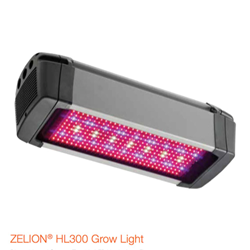 The ZELION HL300 Grow Light is a 100- to 600-watt dimmable and spectra-tunable LED horticulture light fixture. It is designed to meet the plant spectra needs for optimum photosynthesis and energy efficiency resulting in faster growth and increased yields. The ZELION HL300 Sunlight is a 100- to 600-watt dimmable and spectra-tunable LED horticulture light fixture recommended for growth chamber applications where natural light is important or for supplemental lighting where color recognition is important, i.e., in a garden centers. To accommodate an increasing demand from a variety of users, including plant researchers, growers and garden centers, a spectrum was designed to closely match natural sunlight. The ZELION HL300 Grow White is a 100- to 600-watt dimmable and spectra-tunable LED horticulture light fixture designed for horticulture applications. It is designed to meet the special lighting requirements of growers. The Grow White has a combination of the ZELION Grow Light and Sunlight fixtures’ spectrum. This spectrum is used in growth chambers where a higher photosynthetic activity is required or by growers requiring supplemental light where color recognition and rapid, healthy growth are key factors. All of the fixtures in the ZELION HL300 series emit light in the photosynthetically active region (400–700 nanometers) of the visible light spectrum. Their optimized design makes the lights easy to install and they provide the smallest shadow footprint compared to similar class LED fixtures. The lights are designed to withstand crop production environments.